I do love a long weekend brunch with friends. The ones where you order more food than you can comfortably handle, drink at least one glass of bubbles and where you spend hours chatting away. Well, brunch at Cafe Monico was the perfect spot for a recent brunch with Elizabeth. You know you’ve made a good friend when you spend nearly three hours eating your way through the menu and catching up on life, only coming up for air when you realise it’s now dark outside! 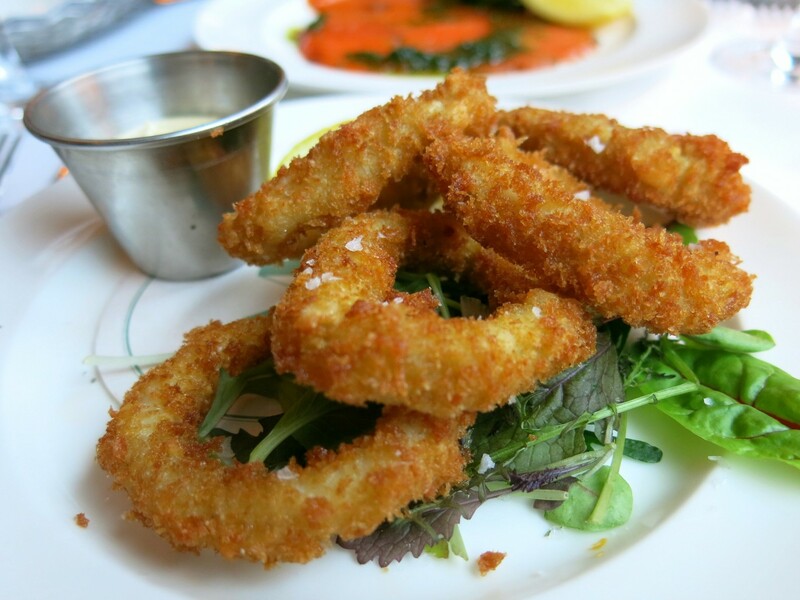 Cafe Monico is part of the Soho House Group so you know it’s going to be a polished affair. And it was. 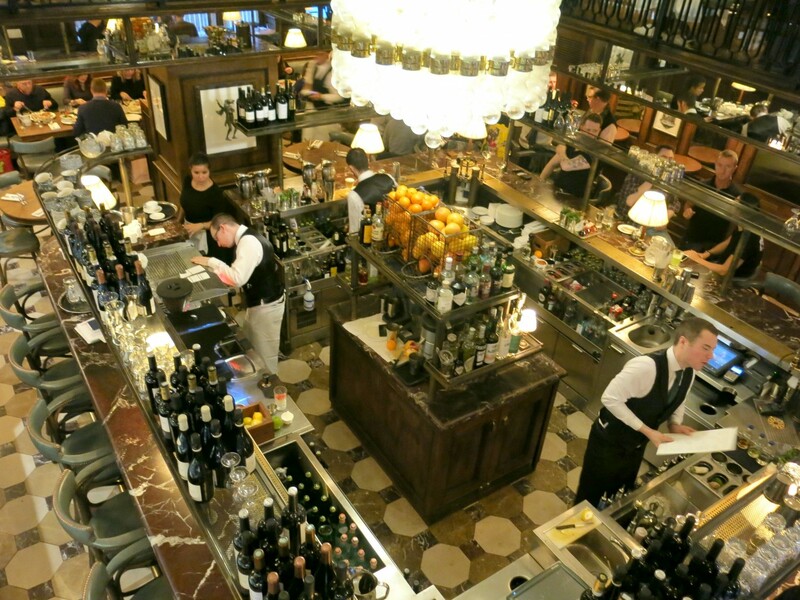 We were shown to our table on the mezzanine floor right by the window so we could watch the buses and tourists go by on one side and on the other we could see the enormous and stunning chandelier leading your eye down to the central bar on the ground floor. There is white linen on the tables, green leather chairs, good music playing, nice staff and a wonderful atmosphere. It feels like a wonderfully stylish place to brunch. This European brasserie serves French-Italian dishes from breakfast through to dinner, seven days a week. Inspired by the original Cafe Monico, established nearby in 1877, the menu consists of shellfish, pastas, salumi, grilled meats and fish. We were dining from the Sunday Brunch menu. There are of course the standard brunch items on the menu at Cafe Monico – croissants, eggs, french toast and fruit – but I like having the option of having a heartier brunch every now and then. And this menu is great for that. Whilst we perused the menu we enjoyed a glass of prosecco and snacked on the bread and gorgeous salted butter. We ended up with a very seafood-centric order! To start we ordered the cured salmon and cucumber and a portion of calamari friti with aioli. I couldn’t believe the size of the portion of salmon that arrived. 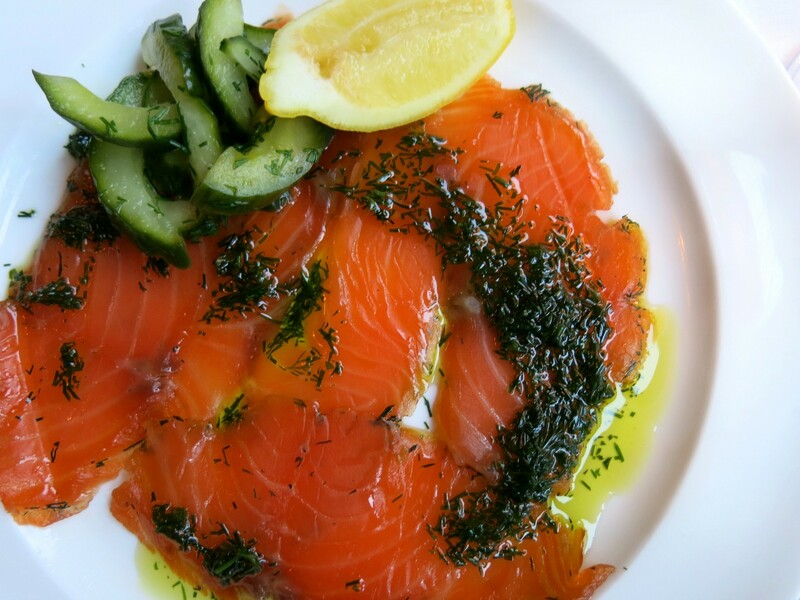 Thick slices of fish partnered with sweet pickled cucumber was a lovely way to start the meal. The batter surrounding the calamari was light and crisp and who doesn’t like a whole pot of aioli to dunk it in! I usually ask the waiter what they recommend when I dine somewhere new, and this occasion was no different. Our friendly waiter was happy to help and talked us through all his favourite dishes! He pretty much professed his undying love for the crab ravioli so we knew we had to order it. 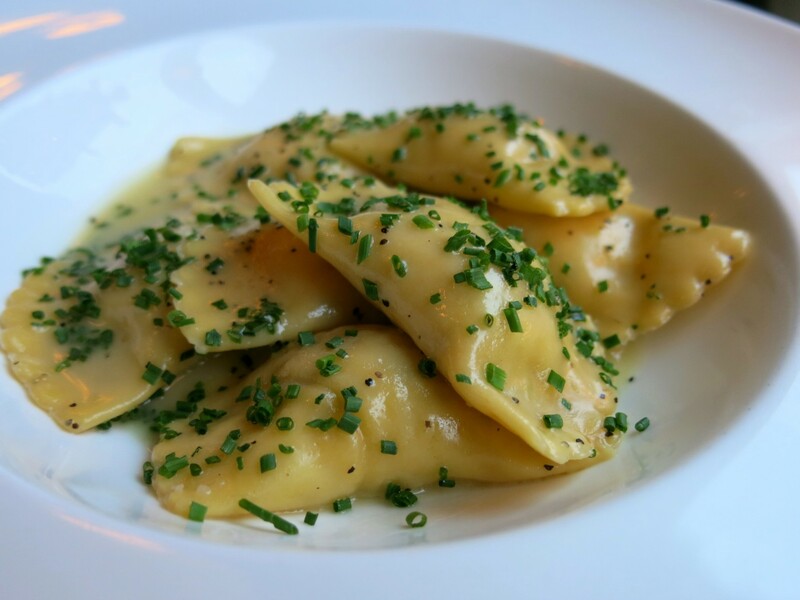 These perfectly cooked parcels of pasta were stuffed full of delicate crab meat and dressed simply with butter, black pepper and chives. The flavour in these ravioli was just remarkable, I’ve been thinking of them ever since! 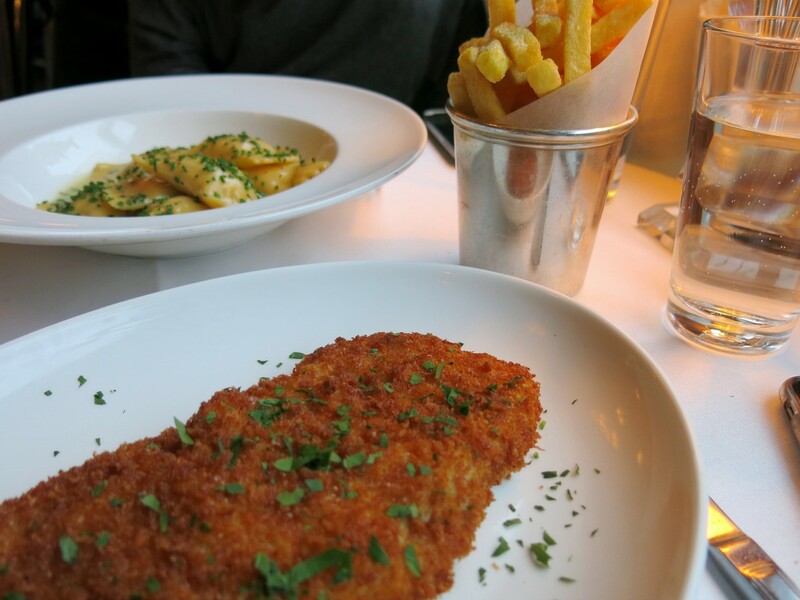 The veal milanese was also a recommendation and it was very good too. I drenched the crispy breadcrumbed veal in lemon juice. I find it so moreish! To finish we ordered dessert that we really didn’t have the space for – but like I said it’s a sign of s good brunch to order too much! The apple crumble coup was fine, though too rich for me with the whipped cream. 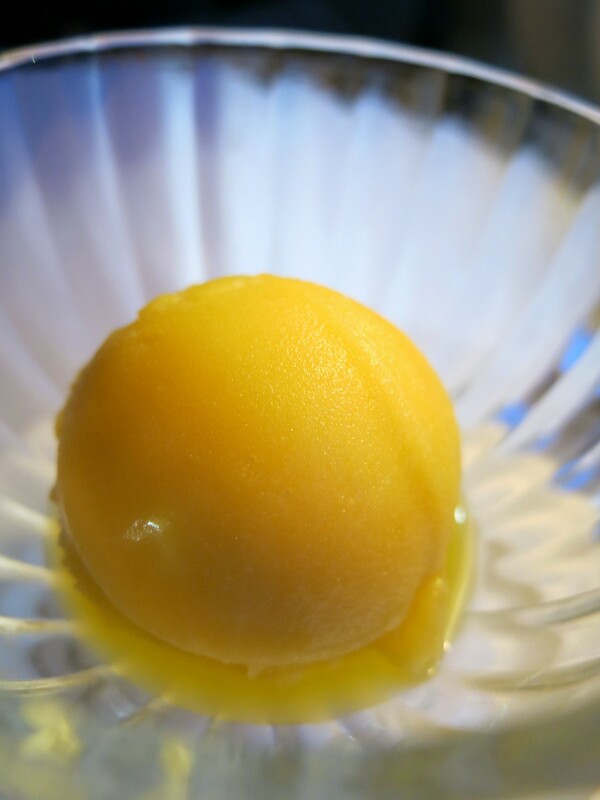 The absolute winner was the scoop of mandarin sorbet! A beautiful palette cleanser and just such a sweet flavour. The menu is not ground breaking, but does it always have to be? I can’t even find the right words to describe the incredible flavour packed into the crab ravioli and the mandarin sorbet was utterly delicious! There is a great atmosphere in here. That kind of atmosphere that you can’t put your finger on what makes it a nice place to dine but it just is. I am going to have to come back, just to try the Sunday roast – we saw a few come out and they look pretty epic. They serve yorkshires almost as big as your head, always a good sign. 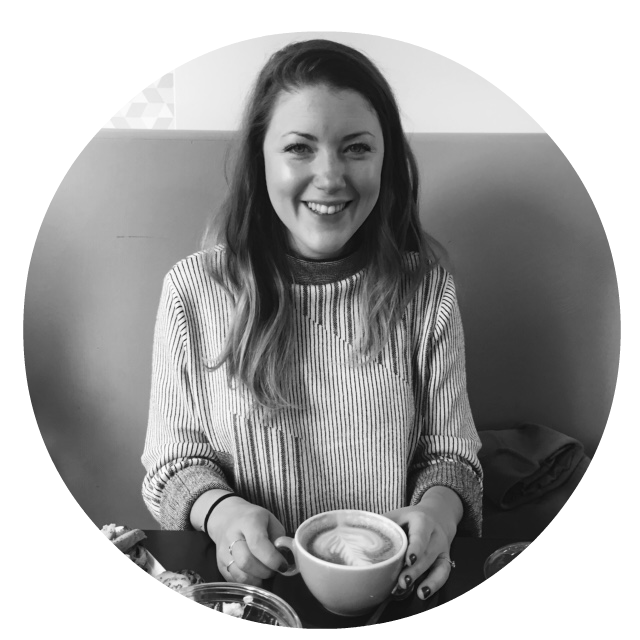 I’m always looking for new places to brunch – where is your favourite spot for brunch in London? 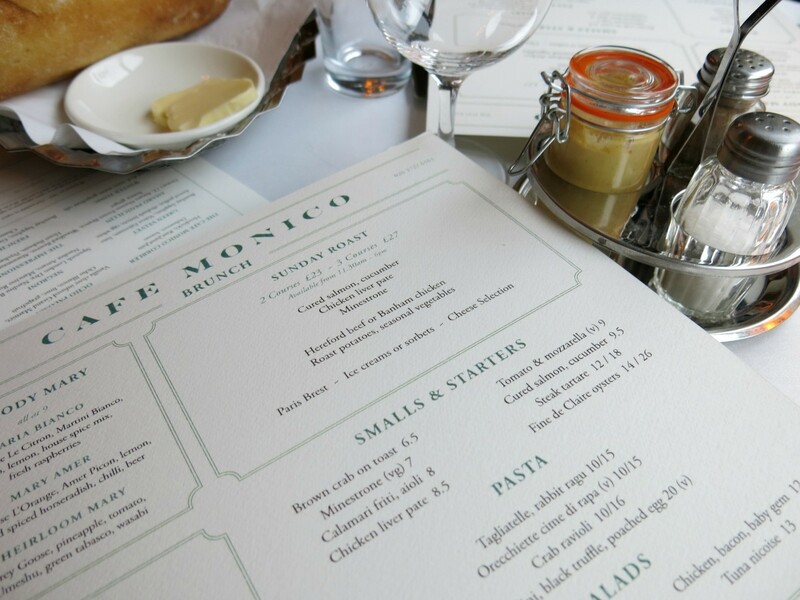 *I was a guest of Cafe Monico, but as always views remain my own including all the crab ravioli loving. This is going straight on my brunch list for 2017! You would LOVE it!!! I’d be very happy to go with you when you do visit! I hate it when you don’t have room to properly enjoy dessert. This is why I feel we should eat dessert at the beginning of the meal. Then again at the end, because there are always so many desserts I want to try. Me too! I always want a taste of all the desserts! Always good to find out about a great brunch place! Thanks Vicky! I love finding new places for brunch in London! Do you have a favourite spot to brunch!? This looks great and actually I have never heard of it, so a nice surprise. Despite the fact that I’m currently cold and drinking tea, I must say I could tuck into that sorbet any day. Onto the list it goes! Definitely add it to the list! 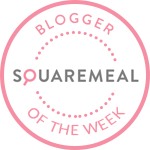 I really enjoyed it – definitely going back for brunch again soon!